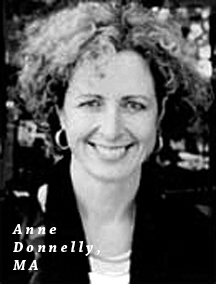 Anne Donnelly, MA is the Health Care Policy Director at Project Inform. She has acted in this capacity since 2006, before which she was the Public Policy Director at Project Inform for 13 years. She is responsible for ensuring that health care legislation, funding, program policies and reform at the Federal and California state levels reflect the needs of people living with HIV. She works to ensure that people with HIV can access affordable, comprehensive and quality care and treatment, with a strong focus on the most vulnerable in the epidemic. She also participates in community organizing efforts, enabling people affected by HIV to have a voice in the policies that affect their lives. In addition she works to educate providers and people with HIV about complex health care systems, how to navigate them and access health care benefits. Prior to joining Project Inform, she worked in a variety of non-profit and for profit organizations and has volunteered for many years in education reform efforts. Ms. Donnelly has worked in the health policy field for more than 17 years, in the HIV field for more than 20 years and has a Master’s degree in Psychology, with a focus in Organizational Behavior. How will the Affordable Care Act affect your health care? In 2010, President Obama signed the Affordable Care Act (ACA) into law. Commonly known as health care reform, the ACA provides new insurance coverage for millions of uninsured Americans. The ACA also puts strong patient protections into place and provides tools to help citizens understand their health care options. Many protections and reforms have already been put into place. Most of the large coverage expansions will take place in 2014. The law is generally meant to ensure that many more Americans will be able to have secure and affordable health insurance. It will also mean that people will have clearer information about their insurance choices, and insurance companies will be held more accountable for delivering quality health care. As soon as the ACA was signed into law, people who oppose it started to challenge the law in the courts and through media. One of the lawsuits made its way to the Supreme Court and in late June 2012, the Court delivered its decision. The Supreme Court reviewed the ACA and upheld most parts of it. The part that requires all Americans to get health insurance (called individual mandate) was found to be constitutional. However, the court found that the penalty for not having insurance must be imposed as a tax. Before the ACA was signed into law, insurance companies could deny coverage to someone on the basis of pre-existing conditions like HIV or hepatitis C and gender. They could also raise premiums based on age and where someone lives. Now, because the individual mandate was upheld, these types of insurance discrimination are no longer in danger of being stripped from the law. The Supreme Court also upheld the Medicaid expansion part of the ACA. This will provide federal funding to help states expand their Medicaid programs to serve all adults under 138% of the federal poverty level (FPL), or about $15,000 per year for one person. However, the Supreme Court did not uphold the part that says Congress could withhold funding if states refuse to expand their Medicaid programs. Although it doesn’t make sense for a state to refuse these large amounts of funding (100% in the first three years), unfortunately several governors have already said they will not expand their Medicaid programs. The problem with this is that about half of all people who would get new coverage under health care reform (including people with HIV) will rely on Medicaid. If a state refuses this federal funding, its low-income individuals would continue to be unable to access health insurance coverage, which is exactly what health care reform is trying to address. The decision to uphold the individual mandate is a victory for people living with HIV and others who have been shut out of the health insurance market. The ban on insurance discrimination against adults with pre-existing conditions will begin in 2014. This means that people living with HIV and/or hepatitis C will be able to get affordable, quality health care and specialized treatment. As for Medicaid, the good news is that many states will expand their programs, allowing people with HIV to get Medicaid coverage sooner. (Currently, most people have to become disabled to use it.) The bad news is that people with HIV who live in states that don’t expand their Medicaid will continue to be unable to afford health insurance and forced to rely on insufficient health care services. Estimates indicate that 50–70% of uninsured people with HIV will depend on Medicaid expansion and will continue to get suboptimal or no health care without those services. Currently, only about half of Americans with HIV regularly see their doctors and only 1 out of 4 are taking HIV medications. Medicaid expansion would allow low-income people with HIV to find the quality health coverage they need in order to ensure continuous care. Research shows that early access to treatment gives people the opportunity to stay healthier and reduce the likelihood of transmitting HIV to others. Learning about these changes in health care programs may seem overwhelming to you, and rightly so. Changes will differ quite a bit state-by-state, and much of how your health care will look is being decided at the state level. Health care providers, advocacy organizations, and even state and local governments are all struggling to prepare for these transitions in HIV care. We are all in this learning process together. We can assume that there will be hiccups along the way. Below are links to two different timelines of the changes that we can expect. It will also be important to check at your state level for the timeline in your own state. Although these changes can be difficult to understand, the ACA will solve many issues that people living with HIV currently face. People with incomes above 138% FPL (about $15,000 per year) who have had problems getting insurance will be able to purchase it through a new market place called an Exchange. The Exchange will be a place where people can compare plans and choose the one that is best for them. If an individual’s income is below 400% FPL (about $44,500 per year), they will receive financial help from the federal government to buy their insurance. People with incomes below 138% FPL will be eligible for Medicaid. For the first time everyone will be eligible regardless of disability status. Also people will be allowed to have a savings account of any amount and still qualify. As of now, it is unclear what will happen if there are states that do not choose to expand their programs. It is very important to note that health care reform does nothing to help people with HIV who are undocumented. It does not end the five-year Medicaid waiting period for most new immigrants. However, new immigrants will be able to purchase insurance coverage in the Exchanges. We will all have to continue advocating for quality care for immigrants living with HIV in the US. We don’t expect these transitions to occur without any problems. And we all have a lot of work to do to ensure that implementation of the ACA meets the needs of people with HIV. Despite these expected challenges, health care for people with HIV will be strengthened after full implementation of health care reform. How can I begin to prepare for changes? Begin to educate yourself about where you currently get your health care coverage. Find out if you will experience any changes in coverage; many will not but many others will. Begin to educate yourself about the insurance coverage you think you will gain. People with HIV have been historically shut out of health care coverage and have much to learn about these new systems. Stay involved with the implementation of health care reform by joining www.hivhealthreform.org and the monthly webinars offered there. Begin to find out if there is anyone planning for changes for people with HIV at your local or state level. Check your local HIV planning council or contact local, regional or state HIV agencies. Keep talking to your provider, clinic and/or doctor about their plans for health care reform. Stay involved in what is going on. If you come across an unfavorable change in your care or notice something that could use improvement, contact organizations or officials to make your voice heard. What resources can I refer to? Project Inform was founded in 1985 to promote the ideas that people with HIV/AIDS should be thoroughly empowered and educated in order to make sound decisions about their healthcare and be actively consulted in the process of developing treatments for HIV infection. Equally as important, over the past 4 years, they have included hepatitis C care and treatment issues in their advocacy portfolio. Project Inform is staffed by independent advocates widely respected for having helped speed dozens of safe andeffective HIV medications to market. Hundreds of thousands of individuals have learned aboutHIV and HCV care and treatment from Project Inform. Through their 26-year history, they’ve ensured adequate government funding for health care programs including Ryan White and ADAP that serve the sickest and poorest people with HIV and/or HCV. Project Inform deliberately focuses their efforts on issues that few other agencies address. Currently, they fight the HIV and hepatitis C epidemics by assuring the development of effective treatments and a cure, supporting individuals to make informed choices about their health, advocating for quality, affordable health care and promoting medical strategies that prevent new infections.